Good Evening Everyone! 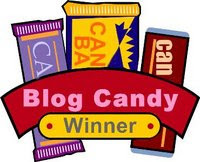 Yvonne is the winner of my blog candy celebrating 100 followers. Thanks again for supporting and encouraging me in sharing my love of papercrafting with you! Wow! I am over the moon to win your generous candy. Thank you so much. You're Welcome Yvonne! I will send you an email later and get your blog candy to you!